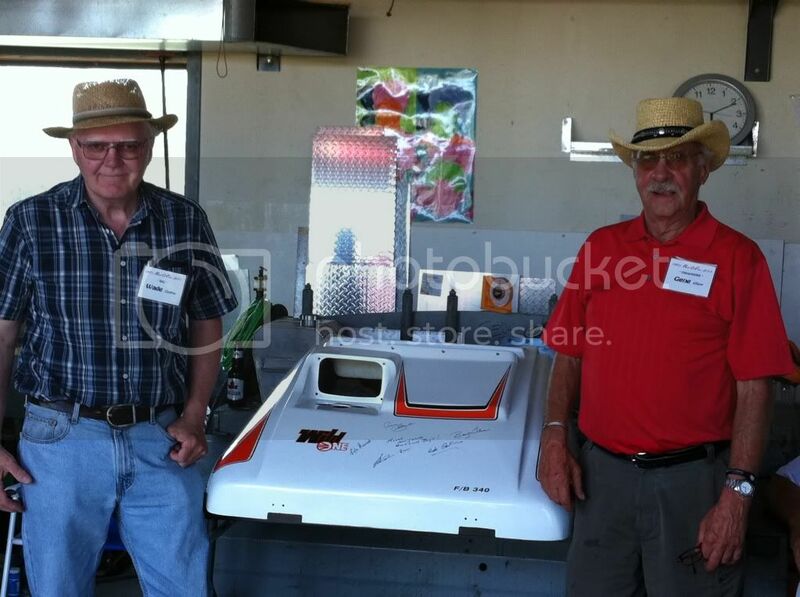 I am very honoured to have met and talked with Gene over the years since I started collecting Roll-O-Flex snowmobiles. I was going to start the restoration of his SnoPro sled to have it on display next summer in hopes that I could reunite him with his machine. Sadly this will not be possible but the restoration will continue in his honour. Here is a great picture of him and Wade at my place in 2011. Hard to tell without a better look at the hood but I would say that you have yourself a 73 or 74 GT. The GT's all had the dual exhaust from 72-74 and dual carbs in 72. The suspension is the stock "super flexion" skid and is nothing optional, so to speak. Ninice sled just1. What's your fist name? I want to put a name to my serial number list. The track is a 1.97 pitch by 58 windows. It is a 15" by 114" track. Same as Ski-doo used. Drivers from a skidoo with the same diameter should work fine. I haven't done any research to find out but you'll be and to find a Ski-doo drive shaft th correct length and diameter. Saturday July 2nd is the date for this years SVSA sled show and swap meet north of Regina. All makes and models of snowmobile are welcome to the show n' shine and anything recreation allowed in the swap area. Completely free for viewers and swappers. Food available all day on site and forklift will be there to assist in any loading or unloading. I just did a set that is headed to Clear Lake, Mn tomorrow. This the 3rd annual SVSA Show and Swap in conjunction with the 5th annual Roll-O-Flex Reunion will be held Saturday July 4th North of Regina. This event is hosted by Tregarva Vintage Racing and will have food on site courtesy of the Nacho Fiesta mobile food truck of Regina so please bring an appetite and cash. Cash will also be good for the vintage swap meet which is growing every year. People are welcome anytime after 11am and your own refreshments are more than welcome. Any sleds from new to old for the show and also for the swap meet. See all you sled heads in a month!